Learner introduces the beginner to rat brain organization and provides elementary coverage of circuits, cells, and neurotransmitters. NeuroNavigator presents a computer atlas based on The Rat Brain: In Stereotaxic Coordinates, by George Paxinos and Charles Watson (Academic Press, Second Edition, 1986). Linker is an extensive database of neuronal circuitry (the afferent and efferent connections between brain locations). DataMaker enables users to add or modify templates of the atlas plates with their own data. In addition, the Reference program, containing more than 320 references, links any desired reference to any data point. The Dictionary defines terms used in Brain Browser and allows users to add new entries. The program includes five high-density disks, a user's manual, and a complete tutorial. User support is provided by electronic mail on CompuServe(r). Department site licenses are available, as well as a buyer's frequency plan. Contact the publisher for complete details. Brain Browser(tm) is a trademark of The Scripps Research Institute. 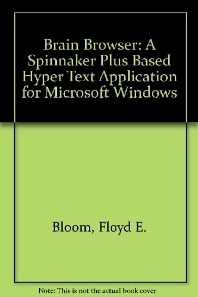 PLUS(tm) is a trademark of Spinnaker Software Corporation Microsoft(r) Windows(tm) is a trademark of Microsoft Corporation. IBM(r) is a registered trademark of International Business Machines, Inc. CompuServe(r) is a registered trademark of CompuServe, Inc. Macintosh(r) is a registered trademark of Apple Computer Inc. Hypercard(r) is a registered trademark of Apple Computer Inc. Intel(r) is a registered trademark of Intel Corporation. Floyd Bloom was the editor of Science magazine, now Brain Research. Scripps Clinic & Research Institute, La Jolla, CA, U.S.A.